Lord, what do you have in mind for me? 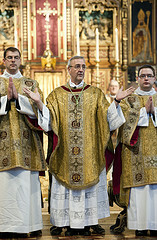 Sermon preached by the Archbishop Antonio Mennini, Apostolic Delegate to Great Britain, during the concluding Mass of Invocation 2011, at Mary’s College, Oscott. I must say that it is for me a very great joy to be here with you at the second Invocation Festival at St Mary’s College, Oscott. But much more important, I have no doubt that it makes God, our loving Father, very happy to see so many of you, spending time in prayer and reflection about your response to his love. In the Gospel for today, the Feast of the Most Blessed Trinity, we have heard the words of Jesus to Nicodemus: that God loved the world so much he sent his only Son that we may have eternal life. To respond to God’s call is to continue the work of the Son. Those who respond to a divine call are strengthened by the Holy Spirit to make present the Father’s powerful and transforming love. Here, at St Mary’s College, we remember the visit, just last year, of Pope Benedict XVI, when he beatified Blessed John Henry Newman. Blessed John Henry wrote that, when he was about fifteen, he began to be influenced by a definite Creed and received into his intellect “impressions of dogma, which, through God’s mercy, have never been effaced or obscured” (1). He had begun to realise that Christianity is not some vague sentiment or empty feeling. It is a meeting with Jesus Christ, the Word made flesh. We encounter him in the Scriptures, the teachings of the Church, in the Liturgy and in our personal prayer. This is where we learn to recognise the face of Christ and to hear his voice. My dear friends when we are young our whole life lies before us. There are so many possibilities and hopes. Our choices and actions will determine what sort of person we become. As we reflect on our lives we discover an inner yearning that we cannot satisfy by ourselves. It is a longing that requires communion with another person and ultimately – because this is how we have been made – with God. St Augustine expressed this truth with the famous words, “You have made us for yourself; O Lord, and our hearts are restless until they rest in Thee” (2). In time we discover that the longing within us cannot be fulfilled by what we accumulate, experience, or by the power we wield. If we want happiness we must resist the temptation to act in ways that will alienate us from God and from our neighbour. Without God something will always be lacking. This was the experience of St Augustine who in his youth looked for excitement in external pleasures. It was only when he found that he remained unsatisfied and started to look within that he was able to recognise the presence of God and so discover true happiness and deep joy (3). Never forget too, that when God calls us by name and asks us to follow him, he offers us true freedom, which is not just a freedom from..important though that be. Rather we are being offered a positive freedom and loved and trusted enough to be his workers in the world. God asks us, in the face of all that seems wrong in our world, to be positive, to build up his Kingdom and to change the world for the better. There is no place for pessimism here, for his call to each one of us is, in fact, liberation. Blessed John Paul II referred to your generation as the “heralds of the new millennium” and he constantly invited you to be apostles to your friends, showing them the path to true happiness. The Christian faith is marked with an irrepressible hope. A significant part of that hope is expressed in the Sacrament of Reconciliation. So do not be afraid to tell your friends about this lovely Sacrament and how it has affected you. Today, sadly, some people believe that they cannot be forgiven. They need to be reassured that, as we have discovered personally, the Sacrament of Penance brings pardon and deep peace. It is also the sacrament which helps us grow in the spiritual life, which is why the practice of examining our conscience daily and regular Confession is so important. Even in those persons who experience the real absence of God there remains a yearning for his Real Presence. My dear young people, to discern God’s call we need to withdraw from external activity and to dedicate time to prayer. At the last World Youth Day Pope Benedict reminded us that “Jesus is always present in our hearts, quietly waiting for us to be still with him, to hear his voice, to abide in his love”(4). Be convinced that the Lord is waiting for you to open your hearts to him in prayer. He wants to meet you personally and to enter into a dialogue with you. This conviction will till you with an urgent desire to seek periods of silence in your daily life where you have the space to be drawn into union with God in prayer. In this regard I should like to commend to you the practice of Eucharistic Adoration which you have experienced during this weekend of discernment. Adoration draws us away from external distractions into a growing communion with Jesus present in the Blessed Sacrament. Encourage your friends to join you in this practice. In Eucharistic Adoration, whatever our personal circumstances, we are drawn out of ourselves towards the Sacramental Presence of Christ who came so that we might have life. “Christ has need of families to remind the world of the dignity of human love and the beauty of family life. He needs men and women who devote their lives to the noble task of education, tending the young and forming them in the ways of the Gospel. He needs those who will consecrate their lives to the pursuit of perfect charity, following him in chastity, poverty and obedience, and serving him in the least of our brothers and sisters. He needs the powerful love of contemplative religious, who sustain the Church’s witness and activity through their constant prayer. And he needs priests, good and holy priests, men who are willing to lay down their lives for their sheep. Ask our Lord what he has in mind for you. Ask him for the generosity to say yes. Do not be afraid to give yourself totally to Jesus. 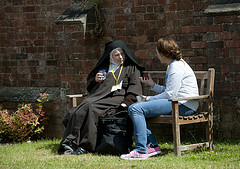 He will give you the grace you need to fulfil your vocation”. This College is dedicated to the Blessed Virgin Mary. St Luke tells us that from Our Lord’s birth she treasured the events of his life in her heart (5). Learn from her. 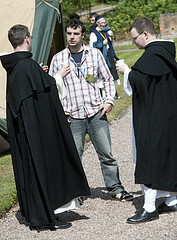 When you feel in your heart the call to respond to a particular vocation do not be afraid. Learn from Mary so that your lives will be filled with joy and “the grace of our Lord Jesus Christ, the love of God and the communion of the Holy Spirit will be with you all” (6). Jesus Christ, the love of God and the communion of the Holy Spirit will be with you all” (6).